Is hypnosis and regression safe? What if I don't believe in past lives, reincarnation, or God? Yes! This method of Hypnosis and Regression is very safe and all precautions are taken to ensure you have a pleasant and uplifting experience. This state is more like a very relaxed state of being - like being guided through a meditation. Keep in mind that having a Hypnosis session is not like having anesthesia. You will likely be aware of your experience as it is happening and very likely to remember much of it when it is over. You are always in control, aware, and conscious of the experience. Think of it like being in a relaxed trance state - we are in a trance state many times throughout our day. For example, we enter these "trance" states when we are watching TV, staring at your computer screen, driving long distances on "auto pilot" mode, meditating, "zoning out" and even daydreaming. It is very simple to get into the state of hypnosis trance. Beyond Quantum Healing is born from the teachings of Dolores Cannon and her Quantum Healing Hypnosis Technique® while also incorporating other modalities and skills on an as-needed basis — such as online and/or distance healing sessions, Quantum Energy Healing, Quantum connection, crystal healing, sound healing, Reiki, and many others. Bridget is a trained and certified Beyond Quantum Healing Practitioner. Other healing modalities that Bridget uses in her BQH sessions include: online/distance healing using Quantum Energy Healing, Quantum Connections, Reiki, crystal healing, sound healing, releasing entity attachments, and ancestral and/or lineage healing. Beyond Quantum Healing allows for the session to be tailored to the individual's needs while also offering online sessions. Quantum Healing Hypnosis Technique® is a trademarked technique that allows for in-person sessions only and the following of a trademarked script, progression and technique throughout the session. It does not allow for interpretation or "moving beyond" the original script. In many ways, this is all the client needs. However, with the changing progression of planetary and collective energies, there is a greater need for more modalities to be included. This is because each session has become vastly different and requires new techniques that suit the individual. Yes, online sessions are not only practical, but safe. We take precautions before starting the hypnosis portion of the session to ensure that the client knows exactly what to do if the internet or wi-fi connection is lost during the session. The results for both an online session and in-person session are the same. You will receive the answers and healing that you are open and ready to receive. Online sessions also allow the client to be in a setting of which they have control, from the comfort and convenience of their own home or space. Of course! Beyond Quantum Healing online sessions literally take place beyond space and time, in the Quantum field. The connection between the practitioner and client is just as strong in an online session as it is in-person. Bridget (located in Dallas, Tx) has worked with online clients from across the world in Australia to across the states in California and Canada. Each online session has been powerful and unique, with one of her most powerful sessions being an online session with a woman in California. The only things you need? A good internet and/or wi-fi connection, a peaceful and quiet place where you will not be disturbed for up to 4 hours, a laptop or computer with a webcam, Skype or Zoom, and a quality headset with a microphone. Headsets that work well include ones similar to this, the Apple AirPods, quality bluetooth headphones, and Apple EarPods with Headphone Plug. There are a few ways to prepare yourself and your energy before coming in to your session. (Please read the page titled, Preparing For Your BQH Session) They include a few quick but important practices to quiet your mind, open your heart, connect to your Higher Self, align with your intentions and most importantly, release any expectations and negative thought patterns around your beliefs. It is rare nowadays — that a person goes into the somnambulistic states of trance in a session. This is because the energy, frequency, and vibration of the planet and of our individual bodies have risen to the point where we can access and "tap into" our Higher Self, Akashic Records, Spirit Realm and intuition much more easily. Most clients usually go to the Alpha or deep Alpha states of consciousness, which is a state in which you are still fully aware and conscious, but in a deeply relaxed and "meditative" state (think daydreaming, auto-pilot driving, or getting lost in a book or movie). Understand that although you are fully aware and conscious of the experience, you are still very deep on a trance level. Many clients come out of their sessions surprised at how far deep they were even though they were aware through it all. Read more ways to Prepare For Your BQH Session here, especially the section titled "Leave Expectations At The Door". The average individual will only need one to two sessions. In most cases, all the healing and personal questions will be answered in one session. However, it depends where the person is at this point in time, as well as history and past trauma. Some individuals can only handle a little bit of healing at a time and may need to come back. Some other individuals will have all their questions answered in a session but would like to come back for a "tune-up" session to continue on their path. Either way, a significant amount of work and healing will be achieved in just one session and you will feel it. Online sessions usually last up to 5 hours, and an individual can gain maximum benefits in just one session. 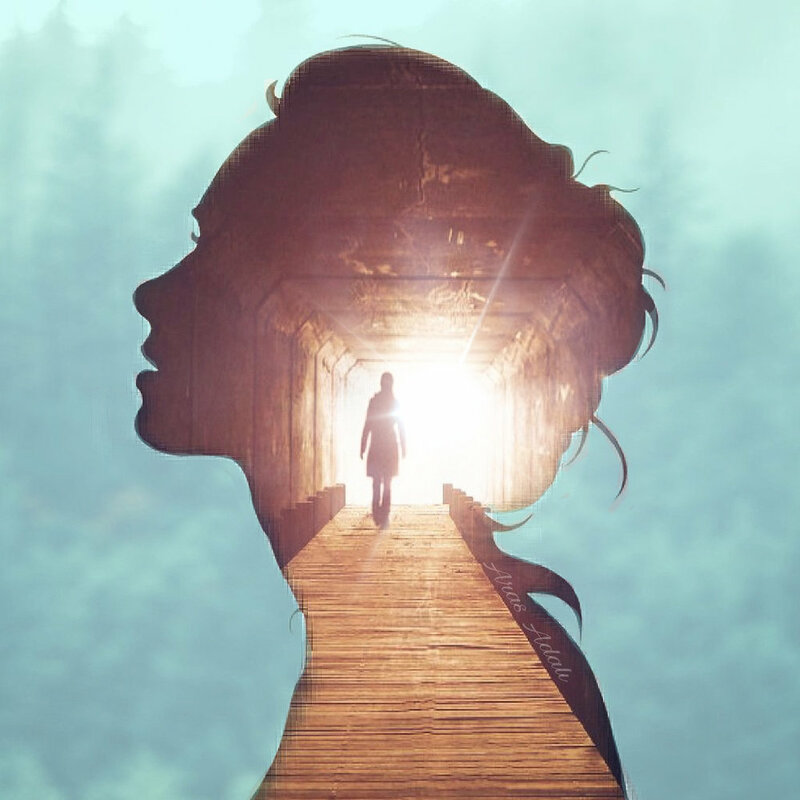 Remember: a Beyond Quantum Healing session involves a connection with Higher Self, Spirit Team, and/or Greater Aspect of You through a self-hypnosis and self-healing experience that is based primarily on your own belief system and thoughts. Your thoughts hold power and energy, like attracts like, and thoughts become things. If you do not believe in a "Higher Self" or greater aspect, have doubts about your session or fear that you will not be hypnotized, then it's possible your session will play those beliefs out. Leave any expectations at the door, keep your thoughts in an open, relaxed, heart-filled space — and be amazed at what is shown to you (this applies to everyday as well!). Everything happens for a reason. You are guided here for a reason. Trust your inner intuition and knowing. Contact me and I'll be happy to discuss any questions you have! Fill out a contact form or email me at bridget@bridgetreneeholliday.com.